MONTHLY PRAYER IN GE'EZ~AHMARIC ARE ON THE LAST SATURDAY OF THE MONTH AT 6:00 PM. EVERYONE IS WELCOME. Starting this summer, three young men have taken leadership for Saturday evening prayers and devotional songs in Ge'ez~Ahmaric at the chapel. Brhne, Mengist and Elias will be rotating leadership. Everyone is welcome. Pictured here at the devotional singing, Achen and Christopher are learning how to participate. 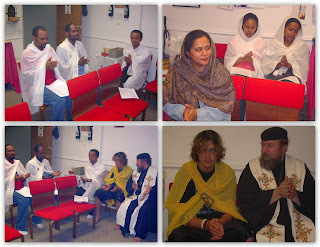 Teresa Kochamma took these pictures at the August prayers.